It's Lacquer Legion time again! February's theme is Adoration. My interpretation ended up being a bit literal (the hearts) and figurative since I incorporated so many things I absolutely adore. 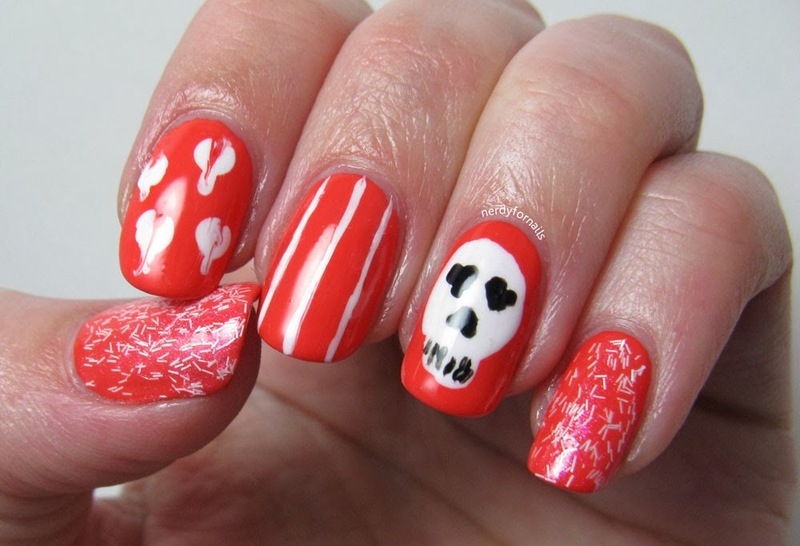 Both of the polishes I used are my own franken creations. I love frankening more and more each time I do it. 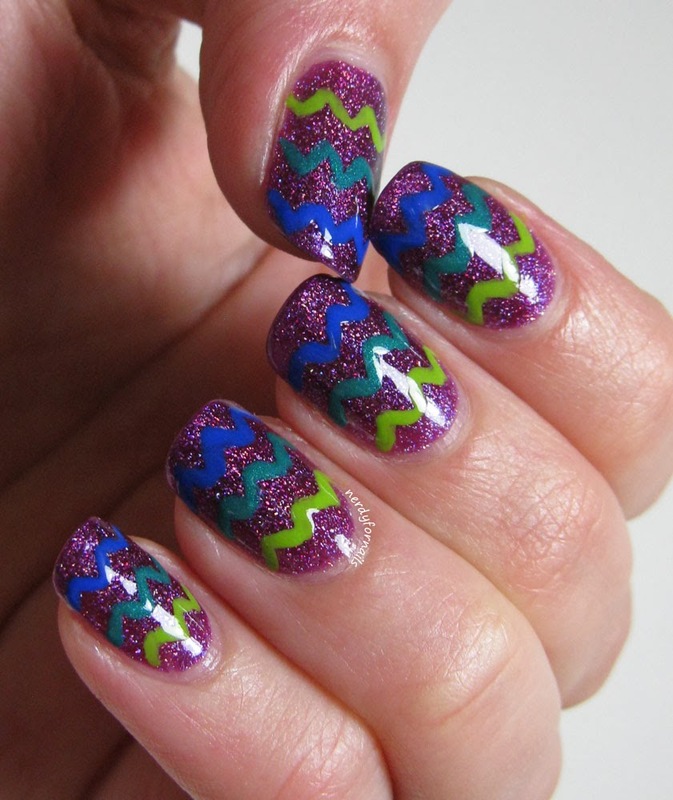 It's so fun to think of a perfect polish and then make it happen. If the gold looks familiar that's probably because it's the one I made for my husband in honor of our second anniversary. 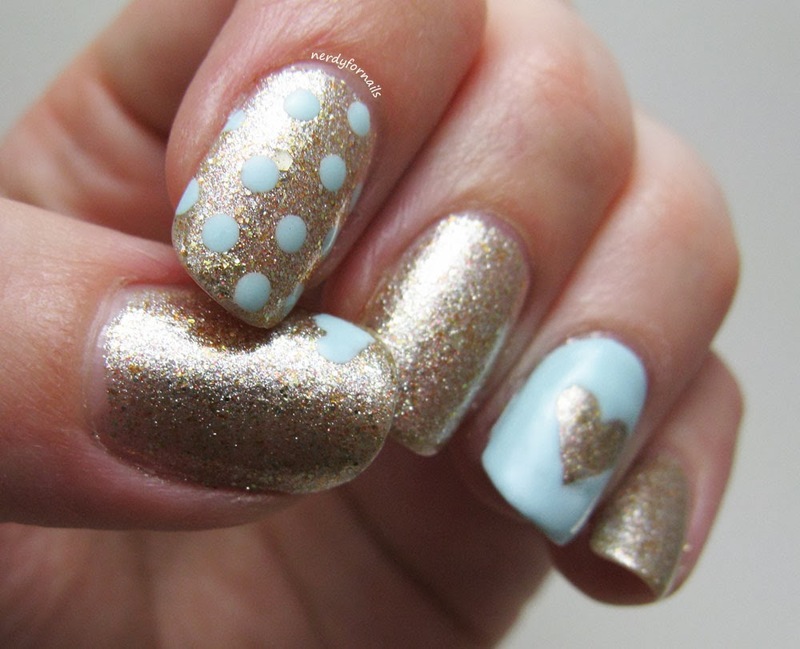 I added some nail art in this pretty pale blue shade I mixed up to go along with the theme. The color combination reminds me of antique dishes, another thing I adore. I always joke that my love for dishes is genetic. I think between my mom, my grandma and I we have enough place settings to serve a dinner party of at least 100 people. An addiction to plates takes up a bit more space and money than nail polish though so I don't have that many yet. 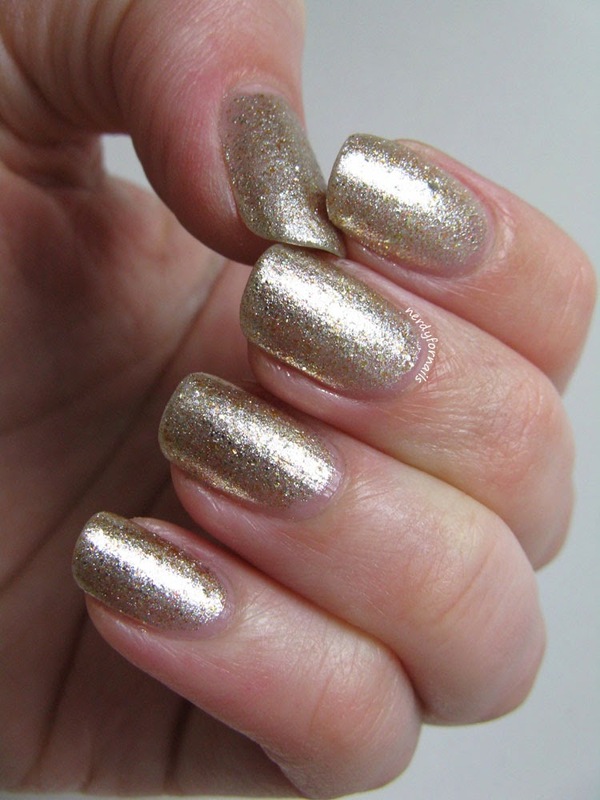 I'm wearing three coats of my franken polish, Golden Nugget. Recently I've been wanting a nail polish in the palest blue shade and hadn't seen any in the stores so I tried making one myself. I think it's actually a bit bluer than I originally wanted but I love it for this manicure plus I can always add more white later. I'm calling this one Blue Bird. It's made up of mostly LA Colors White with a little bit of Wet n Wild Megalast, I Need a Refresh-Mint mixed in. 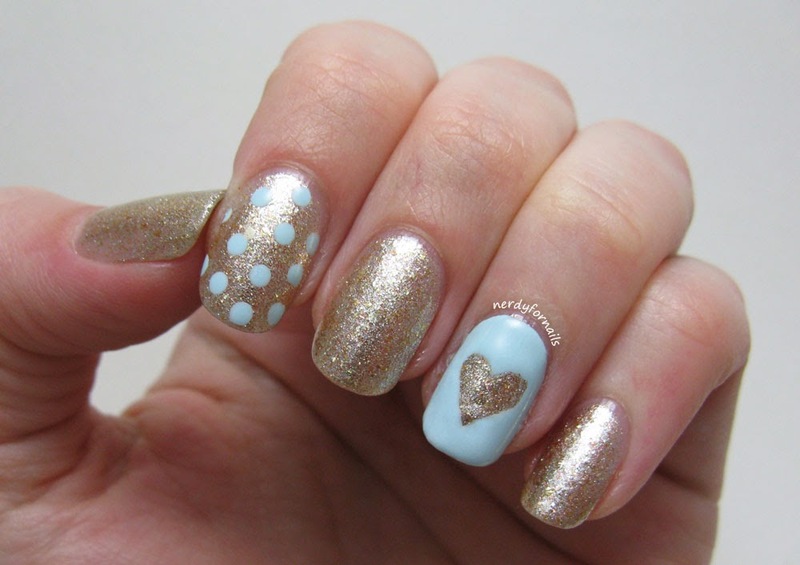 I drew the tiny thumb heart with a small nail art brush and the dots were made with a dotting tool. 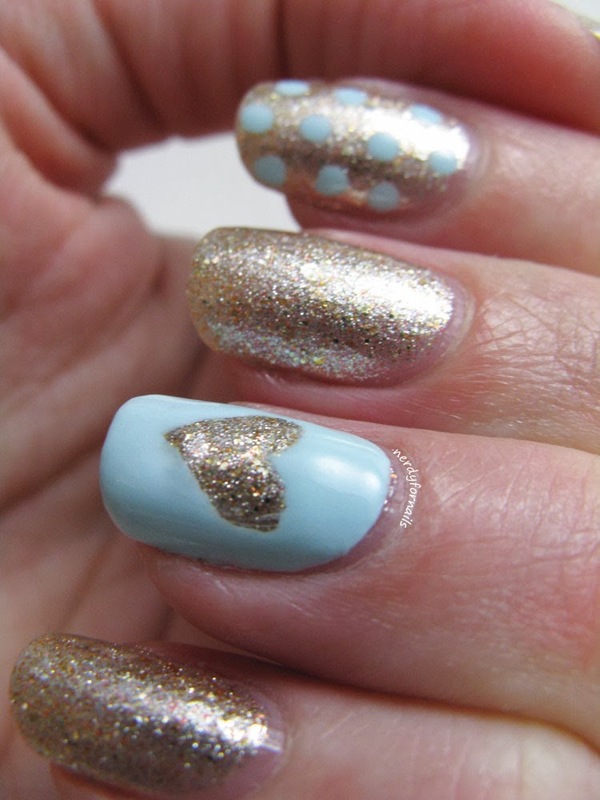 For the heart on my ring finger I traced the outline and then colored outside the lines so the base is actually gold and I added the blue on top. 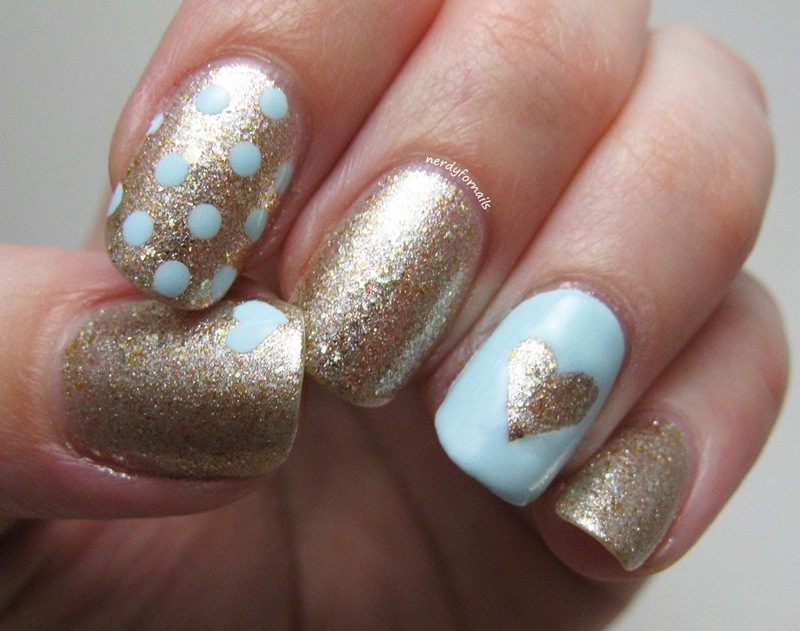 What things besides nail polish do you adore? I'm always curious to hear about other people's collections and/or obsessions. Check out #LLAdoration to see what everyone else is loving at the moment. 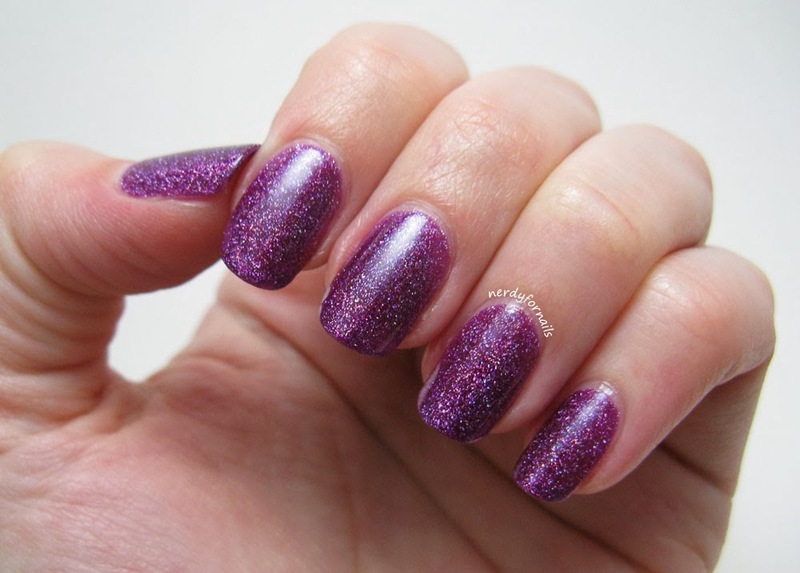 I've got another Zoya to show you today. This beauty is called Aurora. I'm so happy I picked this one. 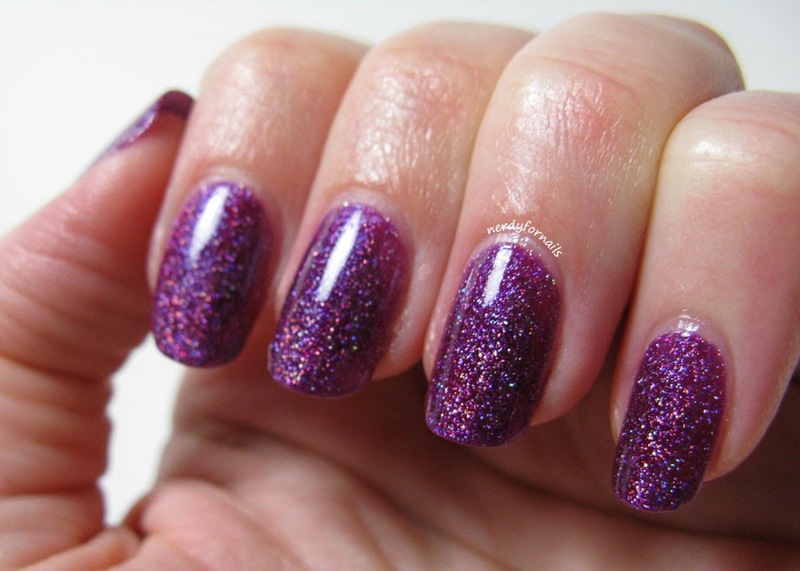 She's gorgeous and the formula was great- like painting sparkly grape jelly onto my nails. 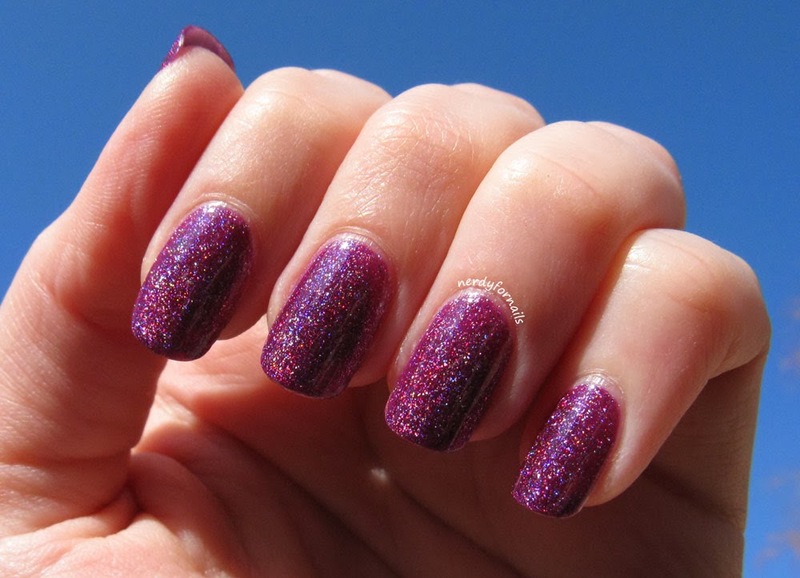 In the shade this polish is pretty enough, but in the right lighting... wow. My first picture is the least impressive. It shows normal lighting inside a light box. 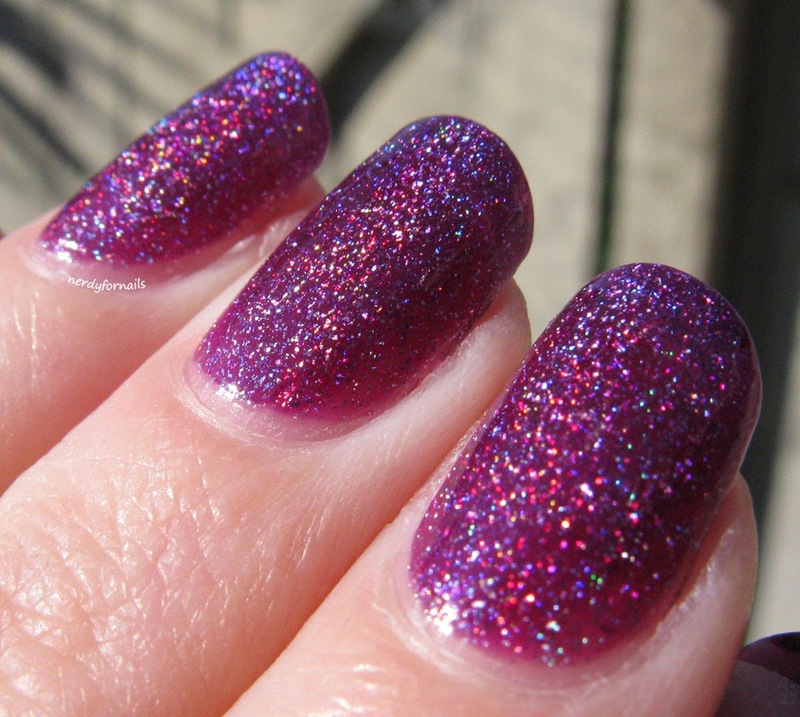 I wanted to include it to show what the polish looks like when the light isn't catching all the holo particles. These next two were taken directly under the lamp- no light box. Rainbows! I don't remember how this one was taken so I'll say a bit more about the application. I've got on two coats for all of these pictures plus top coat. 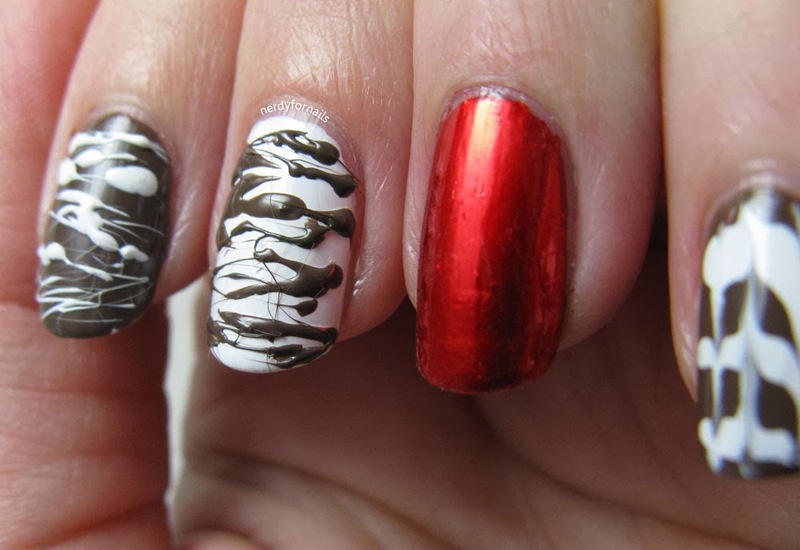 It was a bit sheer on the first coat, but the second one evened it out beautifully. It was so easy to work with- no dragging or patchiness. Aurora is really more of a scattered holo, but it's so densely packed that it starts showing a linear effect in the right lighting. Here's the real wow factor- sunlight. The rainbows really pop out in the sun. Aurora might have just made my top ten favorite polishes. If you need me I'll be outside staring at my nails. Doctor Who is one of those shows that everyone talks about. Everyone talks about it so much that I was over it before I even gave it a chance. You know how it is... Sometimes people talk things up too much and then you're disappointed because it doesn't live up to the hype. Doctor Who is not that show. I was hooked after one episode and I've never looked back. I'm starting the sixth season now and I'm already dreading the day that my Netflix binge will come to an end. It somehow manages to be funny, sad, relevant, deep and completely silly at the same time. It just might be the pure genius that everyone makes it out to be. 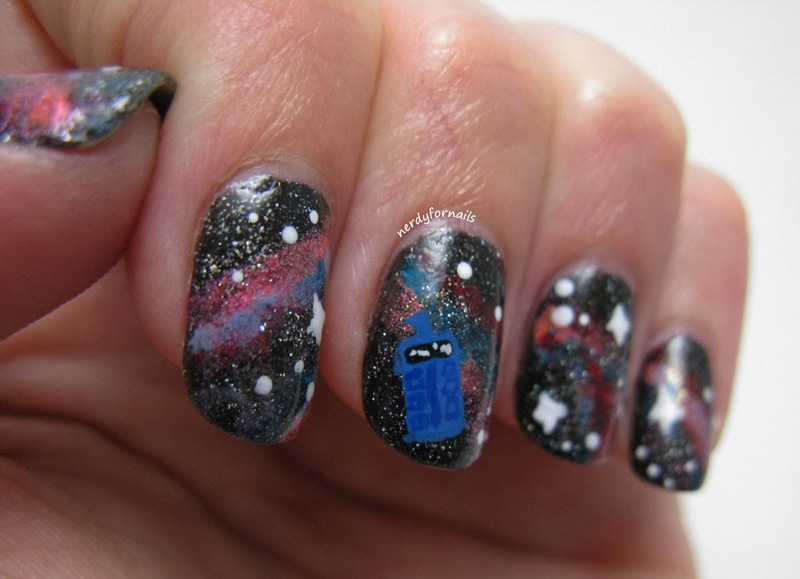 I couldn't wait to do another galaxy manicure so I could add a little Tardis swirling through space. 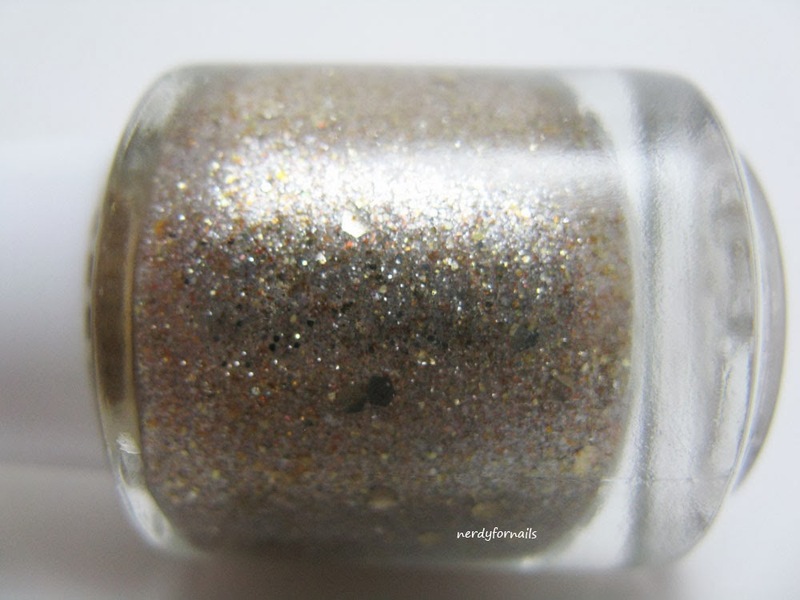 The base for my galaxy is two coats of Zoya's Storm. I sponged on layers of colors focusing on reds and pinks and then I went back and added in a bit of blue to match the Tardis. Galaxy colors include LA Colors in Hottie (neon orange) and Dazzle (metallic pink), Wet n Wild's Red Red and Orly's Teal Unreal. I sponged over the edges with a bit more Storm to blend the galaxy into the background. 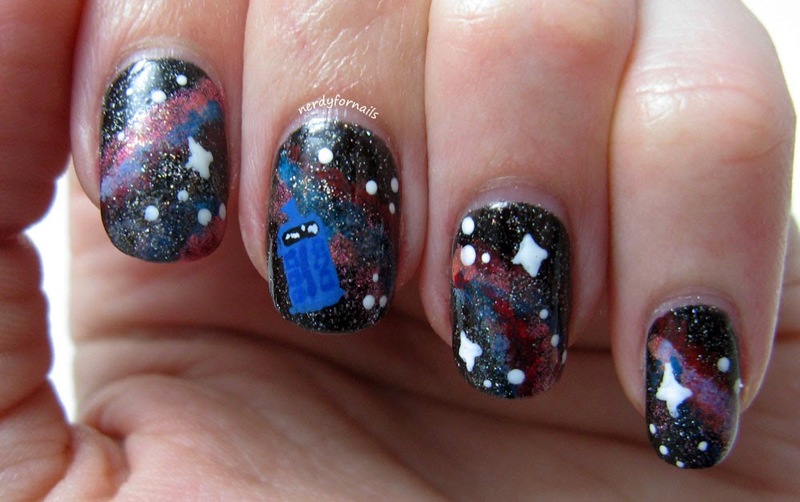 I hand painted the Tardis using acrylic paint and the stars are LA Colors white done with a dotting tool. If you watch which Doctor is your favorite? I don't know if I can reasonably decide since I haven't seen them all yet. I'm not sure if that excuse will hold up though when I'm done with the series and still can't pick. Valentine's Day is nearly here and I've saved my favorite for last. 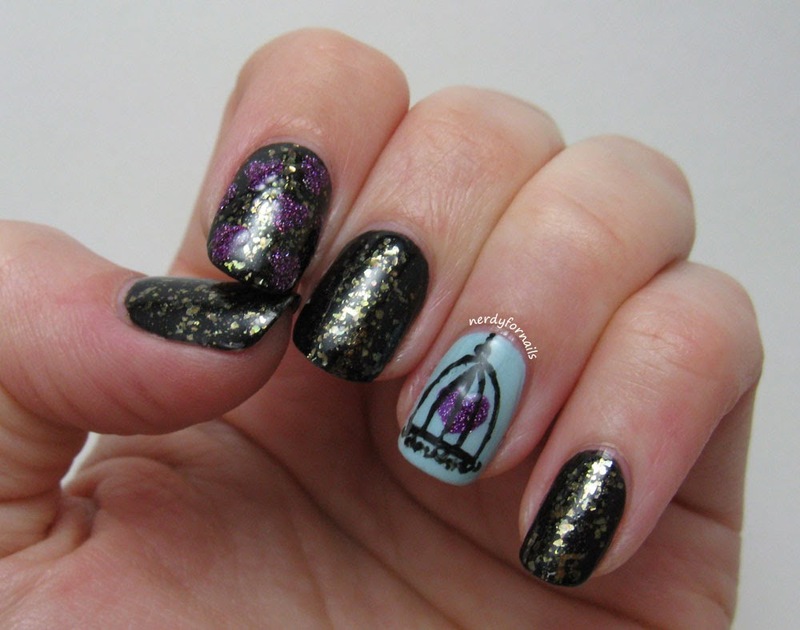 This manicure has got a ton of my favorite things: black polish, hand painted details, purple holo and my new favorite, fake gold leaf. I've really been wanting a nice gold leaf polish, but per my usual cheapness I just can't seem to find one I like enough to pay super big bucks for (yeah.. anything over $10 is pretty rich for my blood). 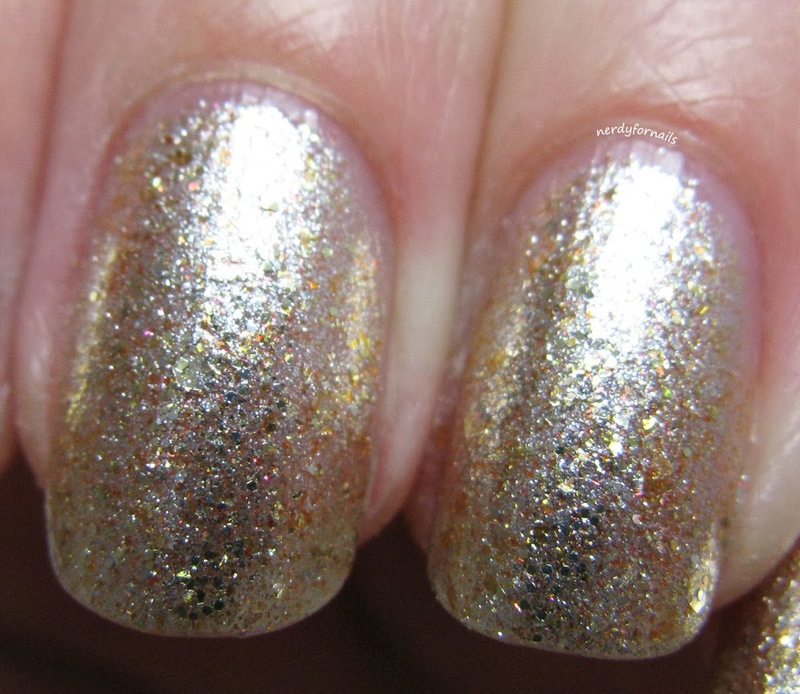 I was at CVS the other day and saw this "gold leaf effect" top coat from NYC for only $2. I absolutely love it. I don't think it will fool anyone into believing it's real gold leaf, but it's a gorgeous gold flakie for sure. The search continues for the real thing though. 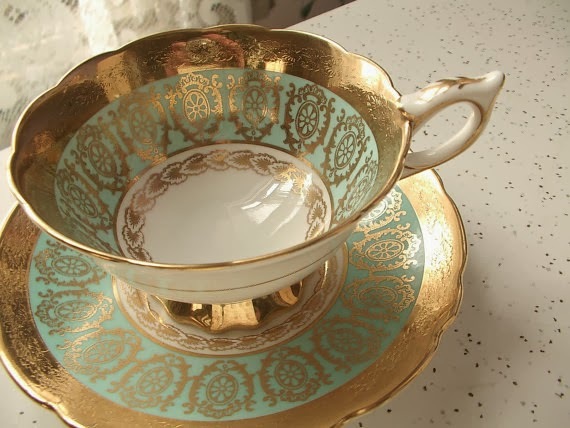 If you have any recommendations for the perfect gold leaf polish let me know. If it's pretty enough I might just have to go for it. 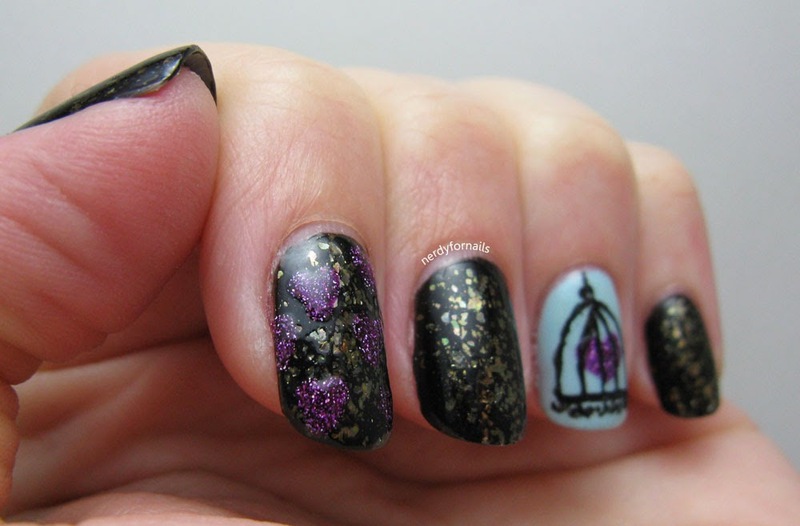 I started out with two coats of my favorite black from LA Colors on every finger except the ring finger. For that I used one coat of Wet n Wild Megalast, I Need a Refresh-Mint and one coat of 2% milk which is a sheer pink I like to layer over bright colors to tone them down a bit. I put one coat of NYC's Top of the Gold top coat on the black nails. 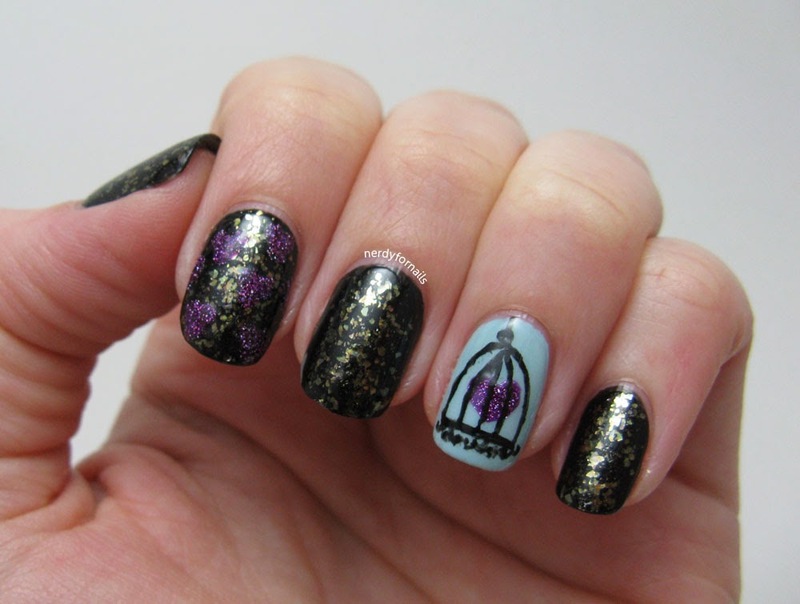 On my accent nails I painted on hearts with a small nail art brush in Zoya's Aurora and used black acrylic paint for the bird cage. 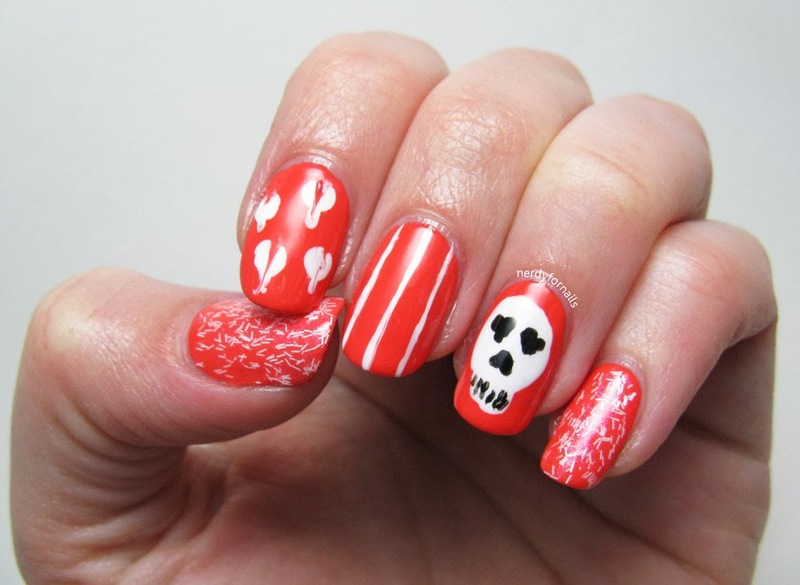 The Sparkle Queen has put together a blog hop for everyone to show off their Valentine's manicures. 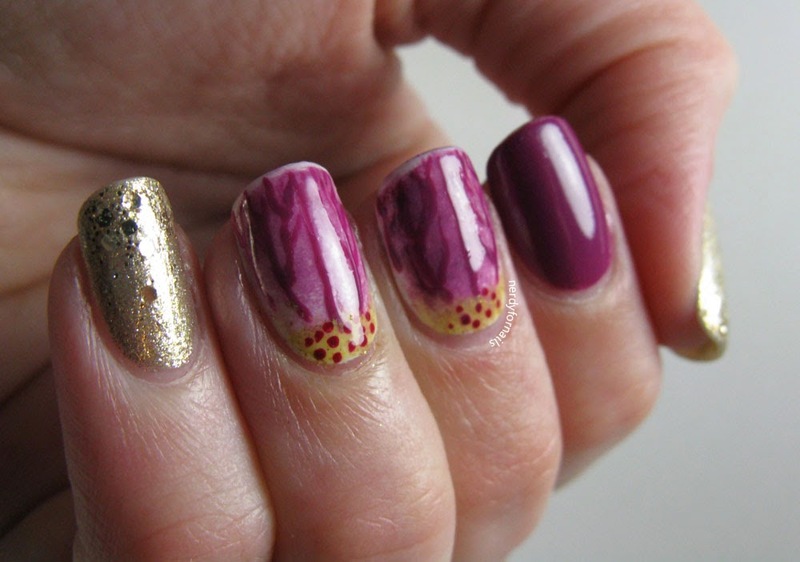 If you need inspiration for some last minute nails... or if you just can't ever look at too many pretty polishes (me!) scroll on. There are some truly great artists in this group. Enjoy! I've got another Valentine's idea for you today. 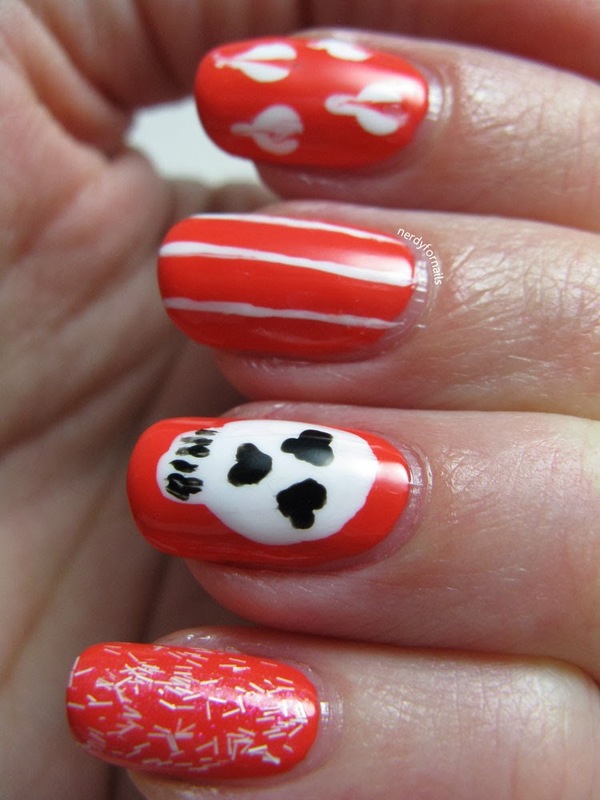 This was pretty easy as far as nail art goes and it's got a bit more attitude than your traditional hearts. 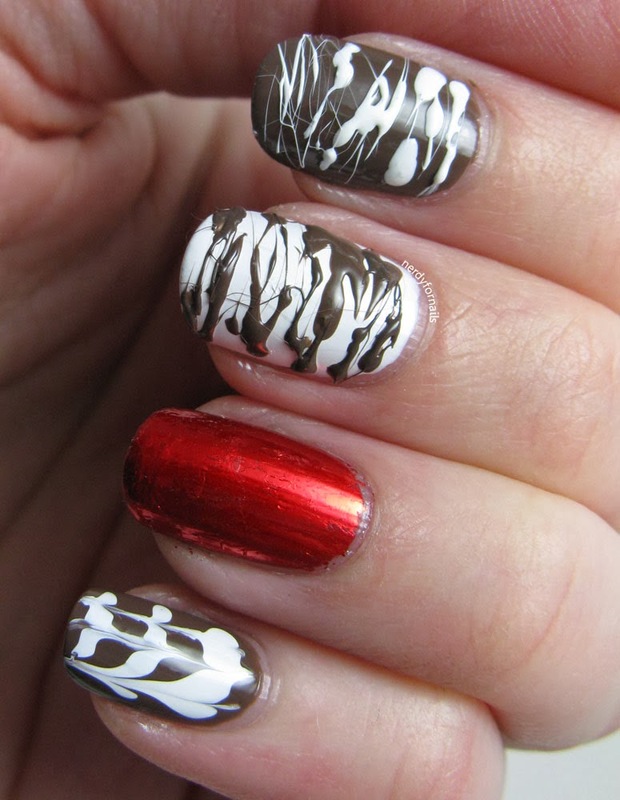 Plus I got to use two new polishes. I'll admit I've been on a bit of a buying binge lately so using two untried polishes wins some major points in my mind these days. Is it bad that I'd be completely thrilled if my Valentine's present was more polish? I just picked up this coral shade, Tangerine Tint by Finger Paints, at my local Sally's and once I got it home I found that it looks very very much like another polish I already have. Still, I have no regrets. It's very bright and cheerful and the formula was really nice. It's not sheer at all and I didn't have any trouble with streaks which I've had in the past with similar shades. I've got on two coats here. On my thumb and pinkie I've got one coat of Finger Paints Frolic In The Snow. I used LA Colors white for the other details. For the marble drag hearts I made a big dot of white with a dotting tool and then drug the tip of a smaller dotting tool through to make a heart-like shape. 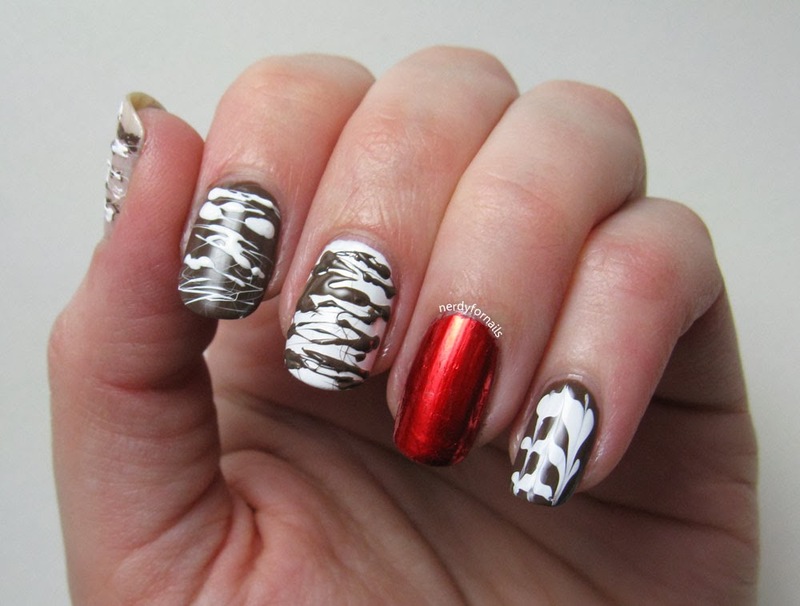 I used a striping brush for the striped nail. I made the skull by using the brush from the white polish bottle to roughly paint on the shape of the skull, then used a small nail art brush to paint in heart shaped eyes a nose and the teeth. Last year when Zoya did their New Years promotion where you can get three polishes for free if you pay for shipping I got my first three Zoyas ever. I've been really impressed by their variety of colors and the formulas are outstanding so when they did the promotion again this year I jumped at the chance to get three more for a great price. After looking at hundreds of swatches I finally narrowed it down to my three winners and Storm is the first one I have to show you. Storm is a black polish with a scattered holo mixed in. The first coat was *almost* opaque enough on its own, but the second made it even more rich and gorgeous. 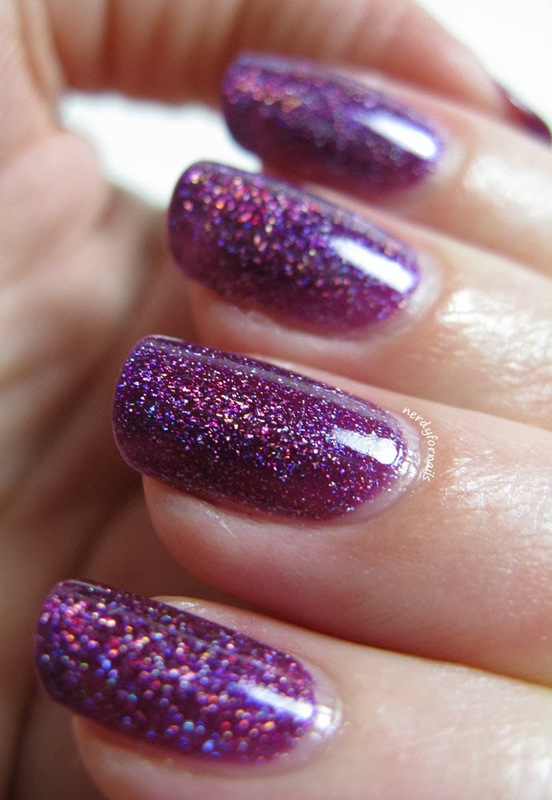 It's really densely packed with holo particles so there's plenty of sparkle. 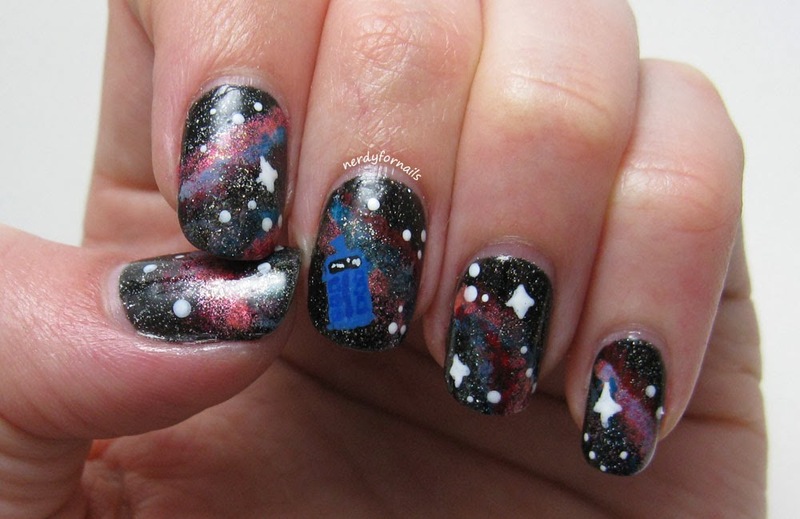 Perfect for a galaxy manicure right? I just might have something like that coming up soon. The sun really shows off the rainbows. I'm glad I got this picture in last weekend before the clouds and some much needed rain took over. 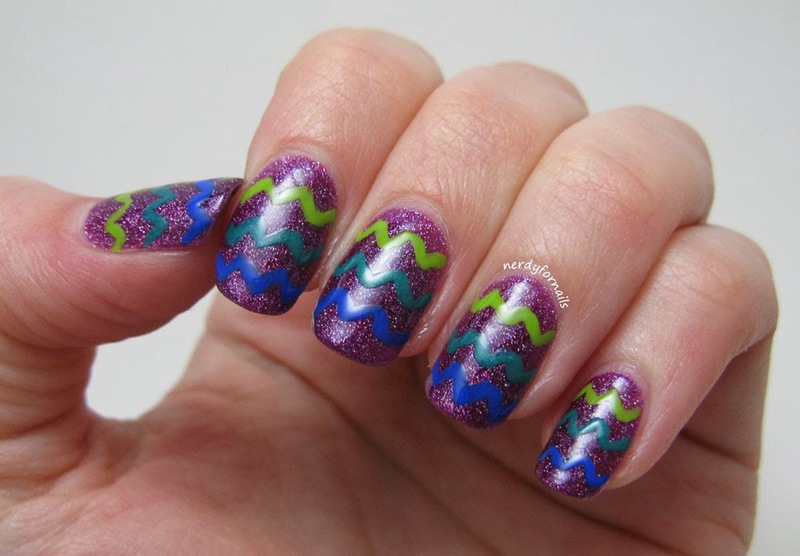 In honor of Pantone's color of the year for 2014 I've got some Radiant Orchid nail art for you today. 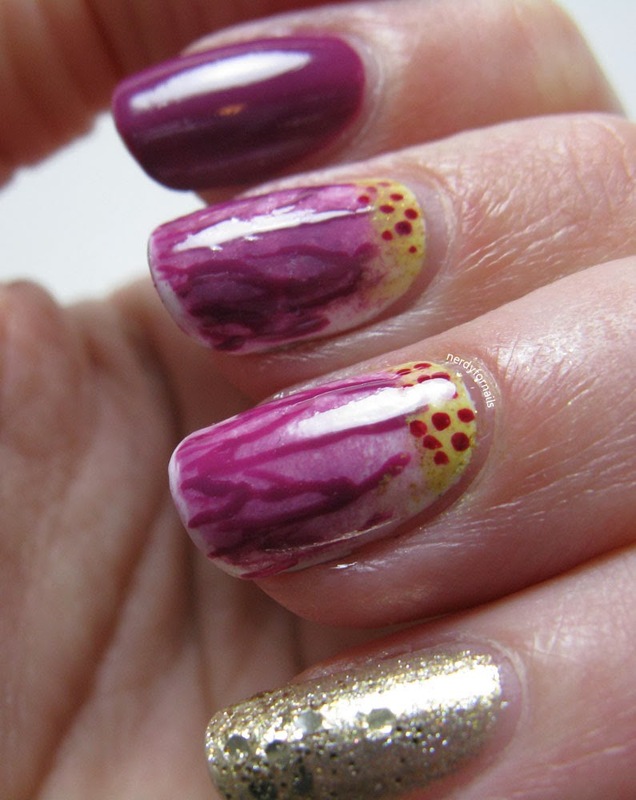 I found this gorgeous orchid polish recently and I couldn't resist getting in on this trend. So what is Pantone and why should anyone care? According to Wikipedia Pantone started in the 50's as a printing shop but they're best known for their Pantone Matching System (PMS) which is a system for standardizing colors so that you can be sure you're getting the same hue across all different kinds of inks and equipment. The college bookstore I work at often uses PMS when choosing ink for t-shirts if the shade needs to be exact (aka school colors). I've always heard PMS thrown around, but never knew the history. 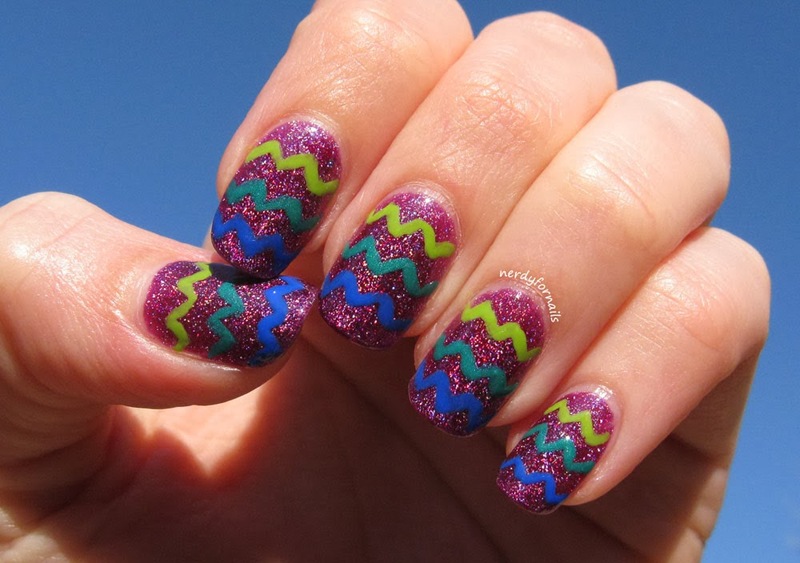 Doing your nails can totally make you smarter! 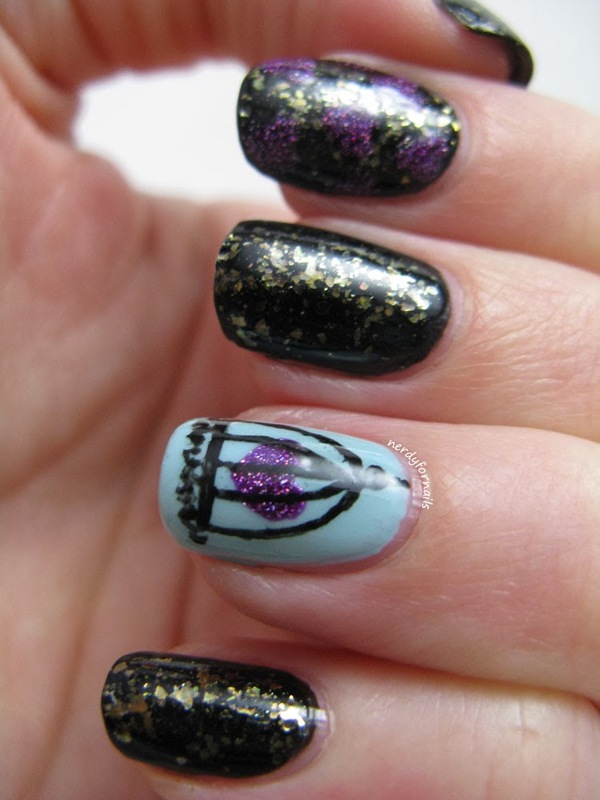 I went with a more abstract interpretation with two of the fingers resembling petals. 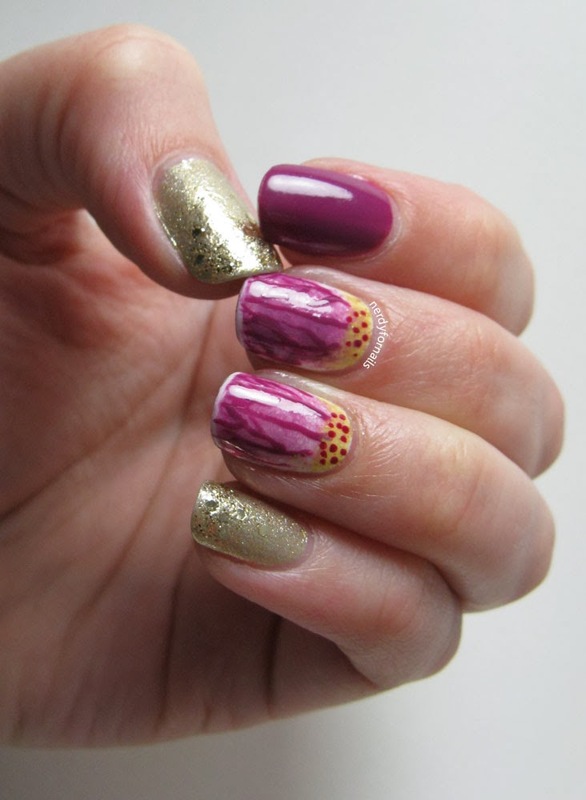 Here's what I used on each nail to create my Radiant Orchids. 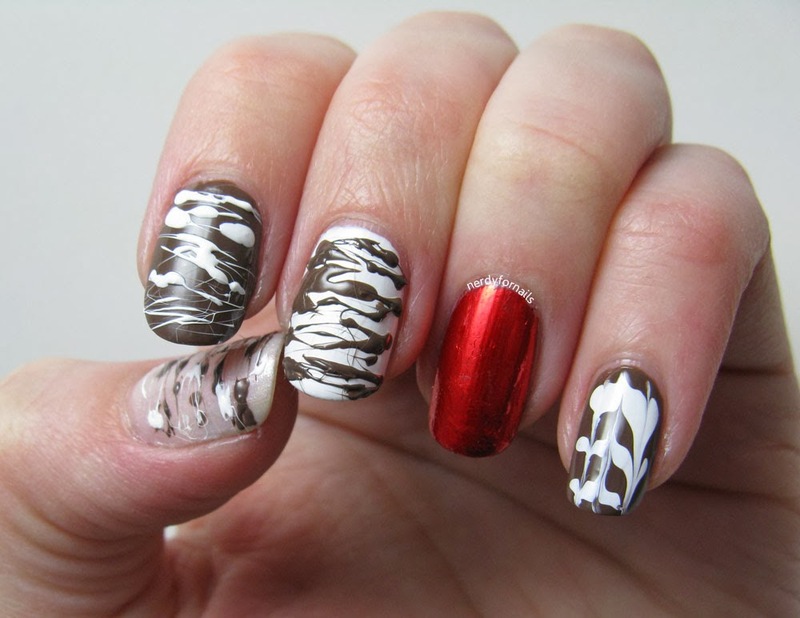 Petals- two coats of LA Colors white polish and one coat of Wet n Wild, 2% Milk to soften the white a little. 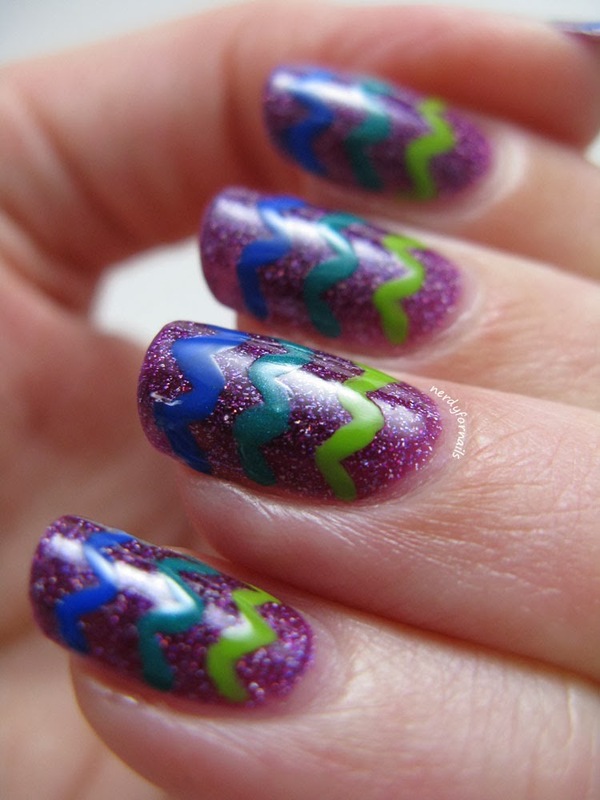 I used a makeup sponge to sponge on a light layer of Through the Grapevine concentrating on the tips. I went back with a cleanup brush and erased a thin line of the purple at the tips to make a more realistic petal. 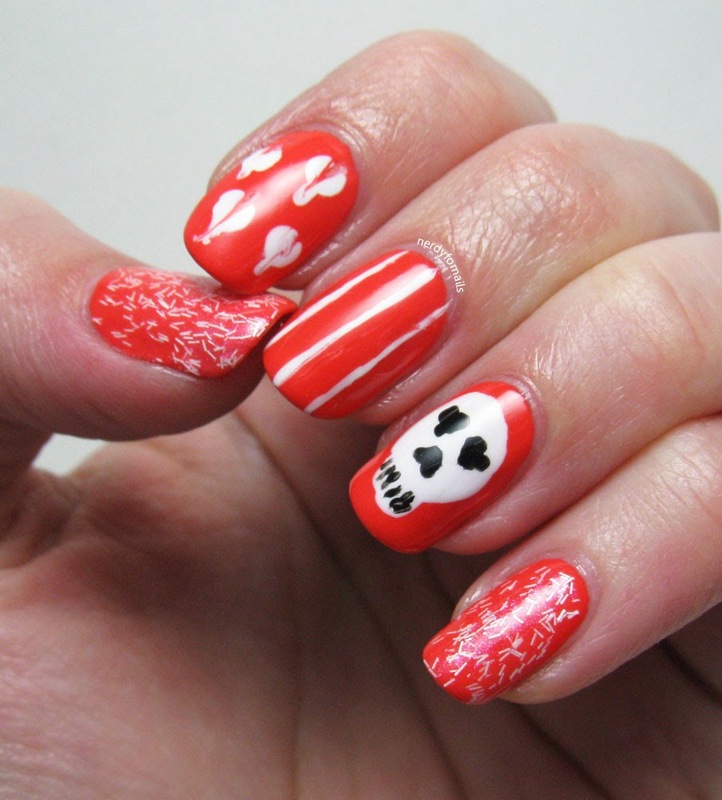 I drew on the veins with TTG and a tiny nail art brush. Next I mixed a few drops of Sally Hansen Insta-Dri in Expres-so Yellow and Wet n Wild, The Gold & the Beautiful and sponged that onto the base of the nail. 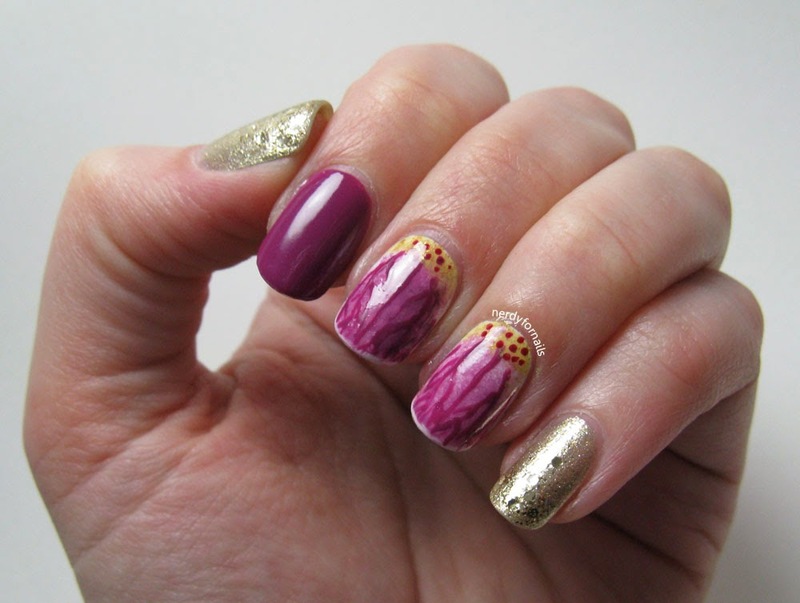 Last I added small dots using my nail art brush with Sally Hansen Hard as Nails, Brick Wall for the center of the orchid.